← Who was “Texas” Thompson? H.S.H. 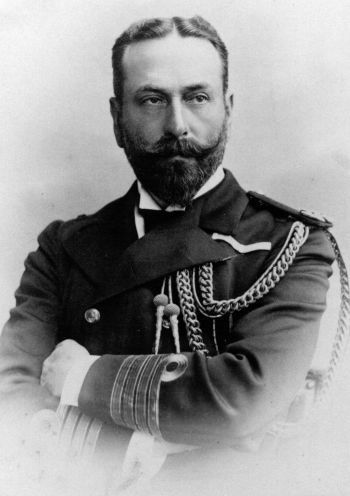 Prince Louis of Battenberg, © Mountbatten Archives. Anyone researching the Legion of Frontiersmen at the British National Archives could well be excused for thinking that it is an organisation of little use constantly disliked or even despised by Government departments throughout its 110 year history. Nothing could be further from the truth. There is no doubt that the old War Office looked on the Legion as an irritant. Perhaps at times they might find a use for this body of toughs who had knocked around the world and were no longer young men. This was a collection of individualists with in the view of the War Office an unhealthy disregard for authority, so to government departments the Legion was in general a nuisance and maybe even an embarrassment. The question has to be asked how there could be a statement from 1910 by the Adjutant-General, who wrote that the Legion was “a harmful and essentially unmilitary organisation”, and a new paragraph 449A could be inserted in King’s Regulations of 1910 aimed specifically at the Legion without any direct action being taken against it.1 Photographs appeared in British national newspapers of Frontiersmen taking part in public events armed to the teeth like Corsican bandits. At the ‘cowboy wedding’ at Shepperton described in the article on “Texas” Thompson” on this site the Frontiersmen made the sleepy town of Shepperton look like some wild west frontier town, firing their revolvers constantly, although fortunately loaded with blank cartridges. The police apparently took no notice of such events and the Frontiersmen were allowed to continue their activities undisturbed. Why was this? Inspection by Major-General Sir Percival Wilkinson, May 10th 1931. 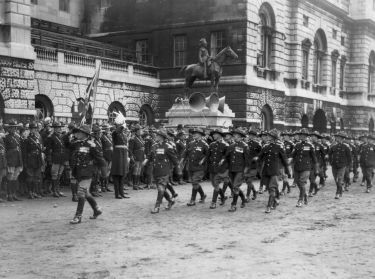 Moving ahead to the 1930s, each May the Frontiersmen were granted the use of Horse Guards Parade for their annual parade with anything from 350 to 800 Frontiersmen attending. Photographs show the mounted Frontiersmen on the finest horses immaculately turned out and behaving impeccably on parade. This was during a period of national depression. Maybe some of the Frontiersmen officers were wealthy and owned horses, but the rank and file Frontiersman seldom had much spare money. The DCM League attracted many Frontiersmen to its membership and both the DCM League and the Legion of Frontiersmen did everything they could to find work for any unemployed members. Many men who had served their country well in the First War discovered that a gallantry medal on their chest was no guarantee of a job. This matter of the horses that the rank and file Frontiersmen used on the parade has been a long-time puzzle. The solution only came when a small paragraph in a provincial newspaper was discovered, which reported that the Guards had loaned the Frontiersmen one hundred horses,saddled and kitted out, for the parade.2 The decision to loan those horses must have come from a very high level indeed! The London Frontiersmen would have had access to Police horses as they were the official Mounted Reserve of the City of London Police. Enquiries came in regularly to the War Office about the Frontiersmen; sometimes, as in Egypt in the late 1920s, the local authorities were pleased to utilise their services, but a similar chilly answer went out to all enquirers that the Legion was not recognised, had no official position, and were not recommended. The one exception was Canada, which went its own way. A country of pioneers and frontiersmen, with a small ‘f’, they found the aims and objects of the Legion eminently sensible and made use of them regularly, sometimes very unofficially and beneath the radar, but they did use them, particularly as an auxiliary to the police. How is it, then, that the Frontiersmen were able to carry on in Britain with apparent support and were not told to cease to exist. The answer is that they always had friends in high places – and sometimes surprisingly high places, even at times Royalty! Inspection Horse Guards 1934 by General Sir John Shea. Photograph showing Farnham Troop reproduced by kind permission of Mrs Audrey Wells. The Countess Mountbatten meeting with some of her Canadian Frontiersmen, British Columbia, 2007. Inspection by HRH Prince George, Duke of Kent, May 1930. There is no evidence that the new King, George V, gave the same support to the Legion as his father, but photographs show occasions when the Frontiersmen provided Guards of Honour to Queen Mary and to the Prince of Wales. He certainly knew all about them and on July 28th 1923 the King and Queen opened King George’s Park at Southfields, Wandsworth. The Legion provided the official Guard of Honour and the King shook hands with Capt. Herrington, commanding between 70 and 80 Frontiersmen on parade, asking Herrington about the strength of the Legion. There were at least two occasions when the controversial Prince George, Duke of Kent, inspected the Legion on parade, although there was a link there as the Dukes of Kent have traditionally been Colonels-in-Chief of the Royal Fusiliers. The Frontiersmen were deeply involved in the Wembley Pageants of 1924, 1925 and later. Even in October 1937 when Wembley received its charter of incorporation the Frontiersmen as well as the Royal Scots Greys were on official duty in front of over 40,000 people. As we can see, the Legion of Frontiersmen were granted the use of Horse Guards Parade every year in the 1930s for their annual parade where, in spite of the War Office files being critical of the Legion, they were customarily inspected by a very senior general. It is impossible to find the actual truth of how and by whom this permission and honour was granted, however the President of the Legion, Major-General Lord Loch, may have had some considerable influence. Lord Loch served two periods as Captain of the Yeoman of the Guard at The Tower of London, a Royal appointment. Following the death of Earl Haig, he also held an influential position in the Haig Fund and was President of the Grenadier Guards Association. It is well-known that King George VI was very supportive of the Boy Scout movement, but he was also well aware of the Legion of Frontiersmen. In 1939 the King and Queen visited Canada. In those days travel was by train rather than aeroplane. This was a journey of around eight thousand miles in addition to three or four hundred miles by car. In the light of the world situation, security was the biggest undertaking Canadian authorities had ever experienced. The R.C.M.P requested the assistance of the Legion of Frontiersmen, then officially affiliated to the R.C.M.P. The Frontiersmen took the chance of proving their worth to be officially affiliated and gave every support all along the route. At the visit of the Royal couple to Niagara Falls, the R.C.M.P. took charge of the Royal route, while the Frontiersmen were responsible inside the Brock Hotel. It came to the attention of the King that one of the Frontiersmen, Chester Russell, M.C., had been a German prisoner-of-war, escaped, transferred to the R.A.F. and served in the same Squadron as the King, then Duke of York. The King made a point of coming out of his room to speak with Russell. When the Canadian tour arrived at Edmonton, Legion Colonel Louis Scott was ordered to visit the King. Scott had commanded the Central School of Instruction, R.A.F., when Captain Prince Albert reported for duty. The King was pleased to meet Scott again, commenting “You haven’t changed much”.7 In later years, Scott recalled that he once had to order the future King to get his hair cut. After the end of the highly successful tour, Col. Scott received an official letter of thanks and congratulations from the Commissioner of the R.C.M.P., Brigadier Wood. What of today? The Legion is very proud to have had as its Patron for over thirty years The Countess Mountbatten of Burma, granddaughter of Prince Louis and a direct descendant of Queen Victoria. Of course Countess Mountbatten does not use any influence on behalf of the Legion, but “her” Frontiersmen are proud to celebrate the long links with the family with the Legion’s title, which has become “Countess Mountbatten’s Own”. 1 British National Archives Kew, WO32/10427, 10428 10429. Paragraph 449A was continued as 518 in King’s Regulations 1926. 2 Derby Daily Telegraph, 12 May 1930, reporting the attendance of the Derby Frontiersmen, said that the horses were supplied “by the Life Guards”. 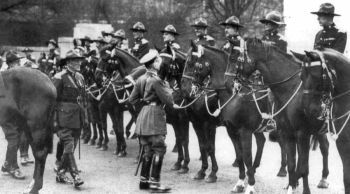 On 11 May 1931 it said that the horses that year were supplied “by the Horse Guards”. 3 Information on the life of Welsh Nationalist Arthur Owen Vaughan, DSO, MBE, DCM, born Robert Scowfield Mills, and who wrote as Owen Roscomyl, can be found in Bryn Owen, Owen Roscomyl and the Welsh Horse [Palace Books, 1990]. Professor John Ellis of the University of Michigan Flint is working on a new biography of Owen Vaughan. We are grateful to Professor Ellis for discovering the quotation within the J. Glyn Davies correspondence, National Library of Wales. Professor Ellis has also discovered the full story of General Gordon’s ring and the Legion motto. This story will appear in a future Topic page written for us by Professor Ellis. 4 Roger Pocock Chorus to Adventurers [Bodley Head, 1931] 29-30. Pocock also told the story in A Short History of the Legion, written for the Canadian Division magazine in 1941. The strange story of the disappearance of Sir Arthur Curtis in Canada is told in Geoffrey A Pocock Outrider of Empire [University of Alberta Press,115-138. 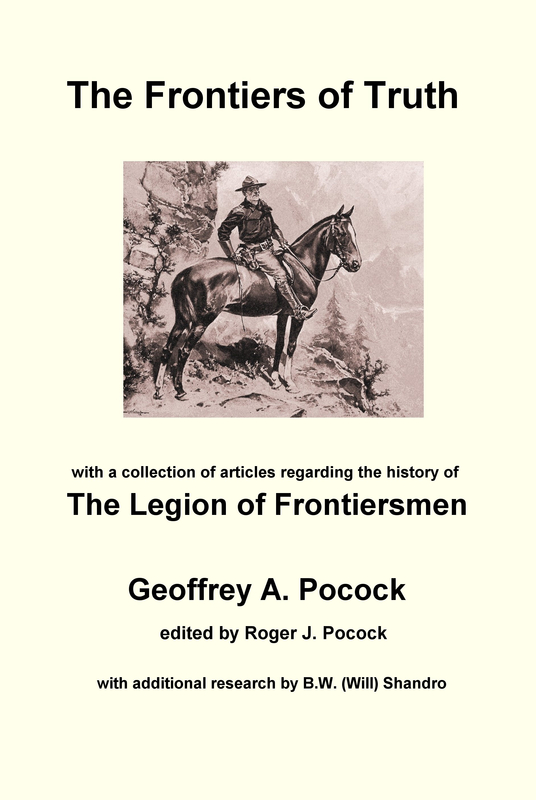 5 Geoffrey A Pocock One Hundred Years of the Legion of Frontiersmen [Phillimore, 2004], also Roger Pocock A Short History of the Legion. Roger Pocock also made notes of this in his pocket diary, now held with the Roger Pocock archive and Legion of Frontiersmen archive at the Peel Special Collections Library, University of Alberta. 1 H.S.H. Prince Louis of Battenberg, © Mountbatten Archives. Reproduced by kind permission of The Rt. Hon.The Countess Mountbatten. 2 Inspection by Major-General Sir Percival Wilkinson, May 10th 1931. Note from the manner the horses are equipped that these are obviously Guards horses. 3 Inspection Horse Guards 1934 by General Sir John Shea. Photograph showing Farnham Troop reproduced by kind permission of Mrs Audrey Wells. 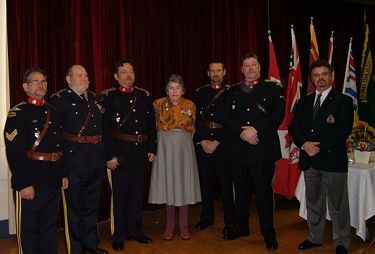 4 The Countess Mountbatten meeting with some of her Canadian Frontiersmen, British Columbia, 2007. 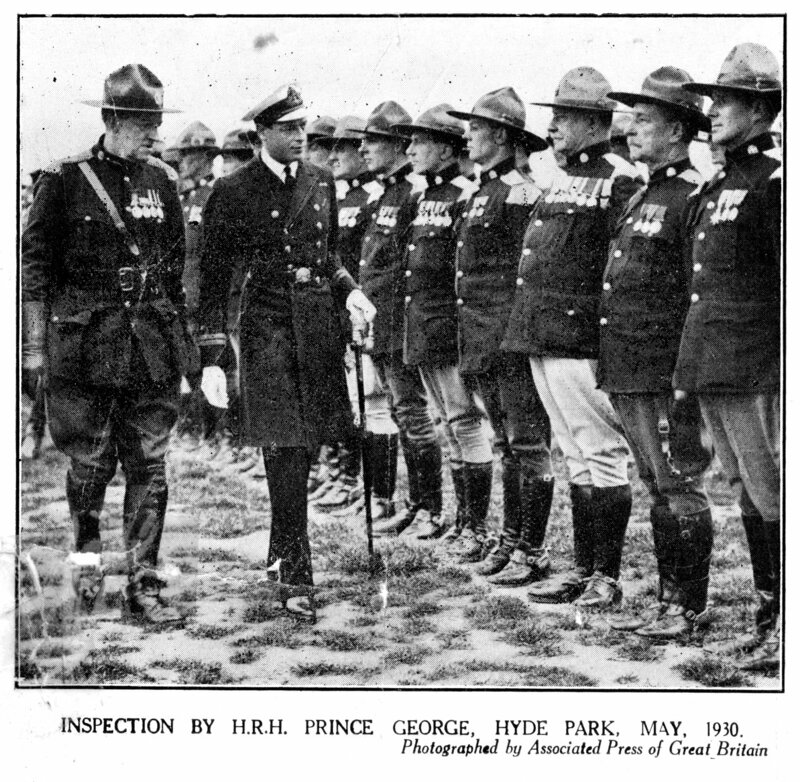 5 Inspection by HRH Prince George, Duke of Kent, May 1930. The article above was originally published on http://www.frontiersmenhistorian.info in June 2014 and has since been revised and updated. This entry was posted in Archive Topics, Frontiersmen, History, Legion of Frontiersmen and tagged City of London Police Reserve, Countess Mountbatten of Burma, King Edward VII, King George V, Prince Louis of Battenberg, Royal Canadian Mounted Police. Bookmark the permalink.